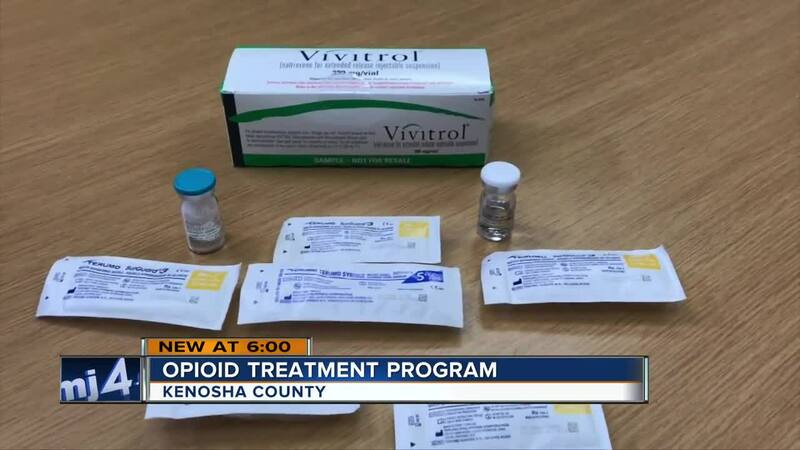 In Kenosha County, officials are working to curb the opioid crisis through an injection called Vivitrol. Once every 28 days a client receives the non-addictive injection. The prescribed drug works by binding to opioid receptors, blocking the high users feel. "You don't feel the high so the brain essentially says to them, 'Why am I using this substance? I'm not feeling the high anymore,'" said Chris Schoen Vice President of Professional Services Group. Along with the monthly injection, individuals also participate in group therapy and individualized therapy, where they are taught coping skills to deal with stress and combat their cravings. "While Vivitrol or Suboxone can reduce cravings, we need to focus on changing their mindset and mentality and support them in their recovery. The therapy component is extremely important," said Schoen. Andrew Tock lives in Kenosha and has dealt with addiction for years. "I used just about everything but I used heroin for about 5 years, from age 16 to 21. I overdosed here in Kenosha and the paramedics tended to me and when I was in jail, I was offered a plea agreement to take this program rather than face charges " said Tock. He has been a part of the Comprehensive Program for just over a year and said the injections with the combined therapy has helped him turn his life around. "Life is so much easier," said Tock. Over the years, the number of participants has grown since the program started in 2016. This year there is about 80 people utilizing the program with a completion rate just over 60 percent. According to Schoen, traditional alcohol and drug treatment programs have a 30-35% success rate. This year there are about 17 participants part of the Opiod Diversion Program. Users are given an opportunity to get help instead of thrown in jail. The program is dependent on each individual's needs but typically last 9 months to a year. Each injection can cost over $1,000 but, Medicaid covers it and Kenosha County said it financially assists those people who are uninsured. However, not everyone agrees with the use of the injection, some doctors are concerned that if a patient relapses, the chances of them overdosing would increase because the absence from the drug has lowered their tolerance levels. "We let them know if you use, (drugs while on the injection) this could be extremely dangerous to you and you could overdose but I go back to the drug screens, less than 2 percent are opiate positive and if they are we take that very seriously," said Schoen. Although the program might not work for everyone, Andrew said for him it's saved his life. He plans to continue counseling and therapy after he graduates and encourages anyone struggling with addiction to hang on and seek help.